Very Short Introductions (VSI) series combines a small format with authoritative analysis and big ideas for hundreds of topic areas. Written by our expert authors, these books can change the way you think about the things that interest you and are the perfect introduction to subjects you previously knew nothing about. Grow your knowledge with OUPblog and the VSI series every Friday, subscribe to Very Short Introductions articles on the OUPblog via email or RSS, and like Very Short Introductions on Facebook. Fungi play an important role for a balanced life of flora, fauna, and humans alike. But are they important for us humans, and how are fungi related to animals? 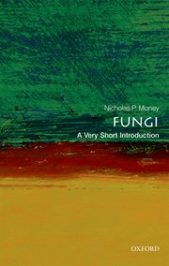 Nicholas P. Money, author of Fungi: A Very Short Introduction, tells us 10 things everyone should know about fungi, and the role they play in the world. Mushrooms and other fungi release an incredible amount of spores into the atmosphere every year, and contributing up to 50 million tonnes of particulates. Fungi are more closely related to animals than they are to plants as they both belong to the Opisthokonta taxonomic supergroup. In contrast to plants, fungi do not have chlorophyll, lack leaves and roots, and never form flowers, fruits, or seeds. Fungi engage in all manner of close biological associations with other organisms, also called symbiosis. They include relationships that benefit either the contributor (mutualism) or in which one participant benefits at the expense of the other (parasitism). Fungi are the most important cause of plant disease. Sometimes, the fungus feeds on living tissues without killing the plant. Other fungi begin by killing plant cells and feed on their dead contents. And still others employ both strategies back to back. Most fungi are omnivores and are very effective at breaking down animal proteins. They are also capable of infecting the tissues of animals with weakened immune systems. Human interactions with fungi can be harmful in many ways including poisonings, exposure to ‘mycotoxins’ produced by fungi that cause food spoilage, and allergies stimulated by inhalation of airborne spores. There are more than 70,000 species of fungi described by mycologists. Over 90% of the described fungi are classified either as basidiomycetes, which produce mushrooms or smuts that cause plant disease, or as ascomycetes, which includes yeast or truffles. Some of the oldest biotechnological uses of fungi include the cultivation of edible mushrooms, and brewing and baking with yeast. In modern times, fungi are used to produce antibiotics, cyclosporine, and other medicines. Featured image credit: close up fungi mushrooms by Pexels. Public domain via Pixabay. Nicholas Money is Professor of Botany and Western Program Director at Miami University in Oxford, Ohio. He is the author of more than 70 peer-reviewed papers on fungal biology and is the author of, among others, Fungi: A Very Short Introduction, Mr. Bloomfield’s Orchard. The Mysterious World of Mushrooms, Molds, and Mycologists, and Mushroom.